It’s not the television contracts, get-out clauses, marketing departments or executive boxes. 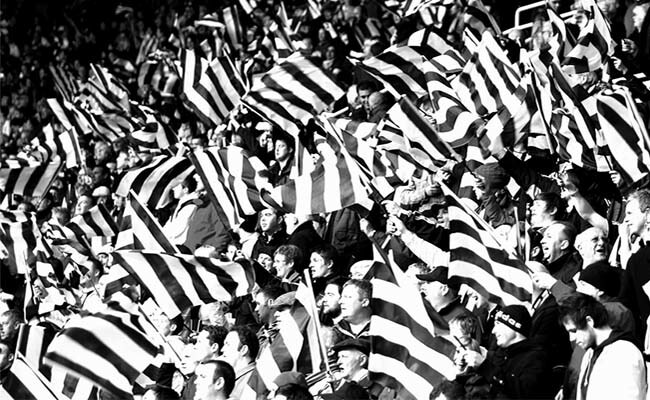 It’s the noise, the passion, the feeling of belonging, the pride in your city. #02 News: Next Newcastle Manager? Arsenal manager Arsene Wenger has confirmed he will step down from his role in the coming weeks and announces Rafa Benitez as his successor. Wenger, 67, will leave his current post and take on a Director role at Arsenal in June, having led the club to three Premier League titles and seven FA Cups during a 21-year reign. Appointed on 1 October 1996, the Frenchman is the Premier League's current longest-serving manager. Rafa Benitez will depart newly promoted Newcastle United to take his place. In a statement to the club's website, Wenger said: "After careful consideration and following discussions with the club, I feel it is the right time for me to step down at the end of the season. I am grateful for having had the privilege to serve the club for so many memorable years. I managed the club with full commitment and integrity." Rafa Benitez is yet to speak on his upcoming departure from Newcastle, but was rumored to be unsettled due to the club restricting his budget. 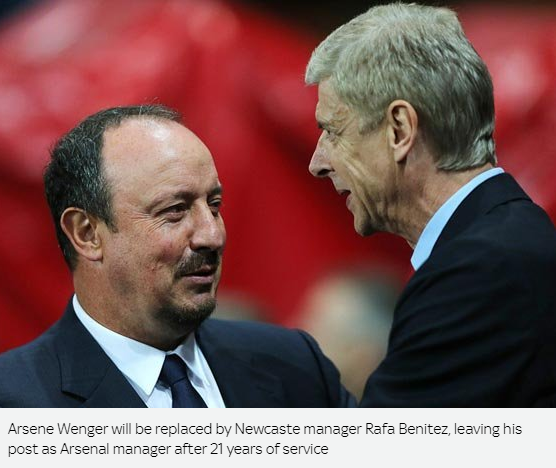 Rafa Benitez explains his departure from Newcastle in his first appearance as Arsenal manager. Meanwhile, Brendan Rodgers and Michael Laudrup emerge as favourites to replace him. 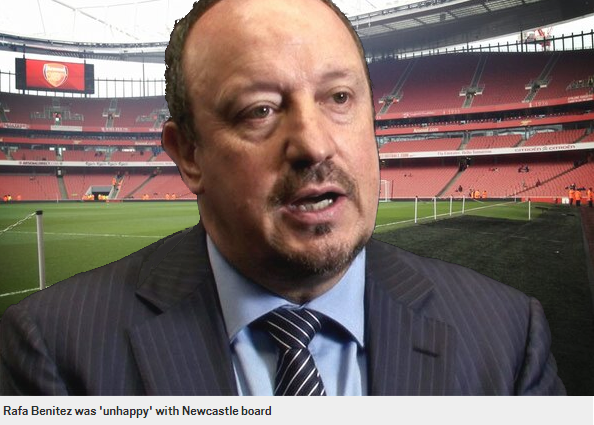 "I was unhappy with the ownership at Newcastle," Benitez said bluntly in his press conference, "I enjoyed the fans, the team, the stadium, but I had too many restrictions to work with, so I simply could not refuse Arsenal when they approached." 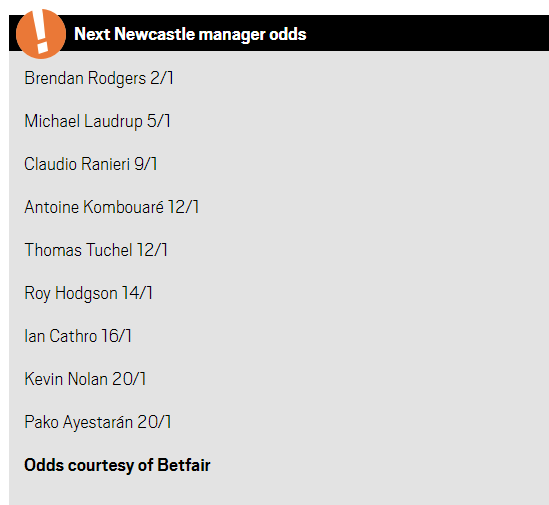 The favourite to take the job on Tyneside is Brendan Rodgers, who, after hinting at interest, leads the race at 2/1. Michael Laudrup, who is reportedly a target for the club, is second favourite at 5/1. Claudio Raineri, Antoine Kombouaré and Thomas Tuchel are reportedly in close contention, with former Newcastle player Kevin Nolan also in the conversation. Hmmmmmmmmmm. I reckon Ranieri might be making a return here, would love that. I think a certain Newcastle legend might be on their way back though! Understandable from Rafa it regards to both the move to Arsenal and his reasons. I'm interested to see who will take over the vacant position - I do hope Claudio! Ex-Newcastle captain Kevin Nolan has been appointed as manager of the club on a one-year contract following Rafa Benitez's departure to Arsenal, allegedly being chosen over Michael Laudrup due to lower wage demands. Nolan was announced as manager this morning in an official post on the club website, departing his role at Notts County with immediate effect. The 35-year old's ambition reportedly impressed the board, who had also interviewed Antoine Kombouaré and Michael Laudrup. Laudrup, who won the League Cup as manager of Swansea City in 2013, was reportedly the club's first choice. It is reported that Laudrup demanded a 45,000 p/w contract, with Nolan being selected as a 'cheaper option', requesting only 18,000 p/w. Nolan's first game in charge of Newcastle will be against Hamilton as part of the club's Scottish training camp. All of these transfers occurred in real life. I disabled the first transfer window for added realism. Interesting to see the club taking a punt on Nolan. 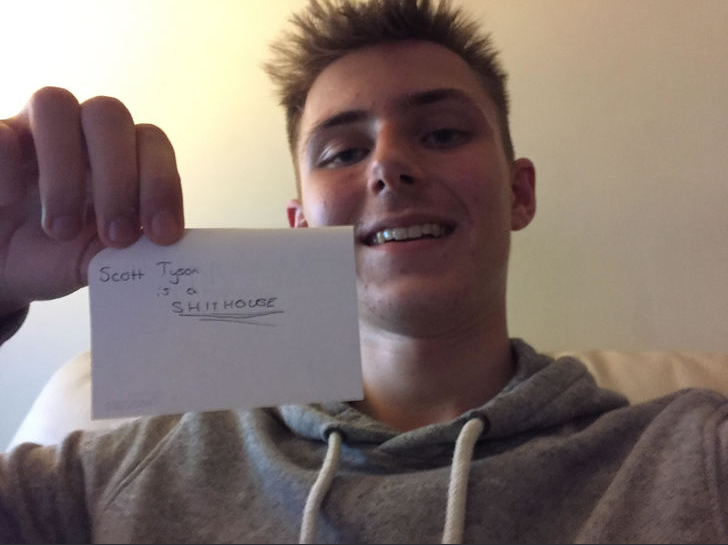 Considering some of the comments he has come out with irl, I think he could do with some training on his media work. A different approach with disabling the transfers but something I do like as it adds a sense of realism definitely. Even living with a Toon fan, I genuinely forgot Aarons was over in Italy! 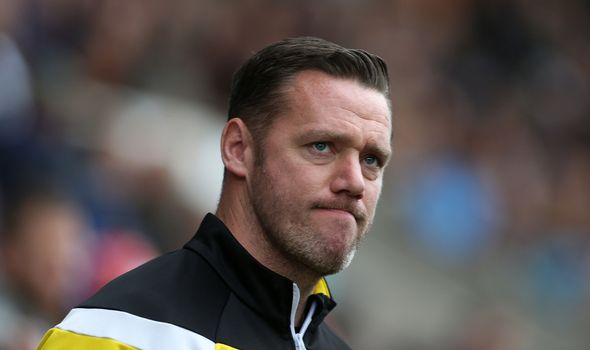 Jamaal Lascelles has voiced his confidence in newly appointed manager Kevin Nolan. 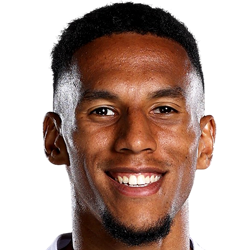 "The players and staff are all working together in preparation for the season," Club captain Jamaal Lascelles said in interview following Newcastle's 1-0 win over Hamilton Academical. "We all support the manager and we're ready to hit the ground running in the Premier League." "We know it's not going to be easy but we're working constantly to be at our best. Everyone's excited to be back up and we are going to do everything we can to ensure we stay here." 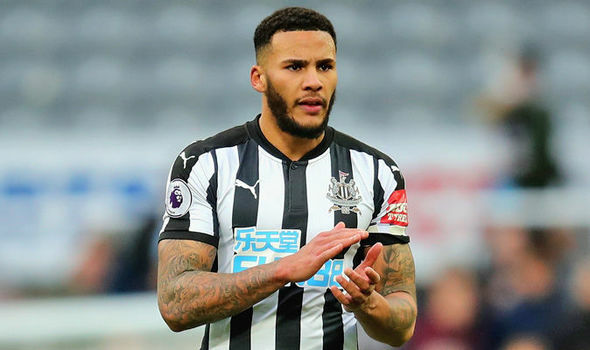 "[Rafa Benitez] is a brilliant manager, of course, and we all have a lot to thank him for," Lascelles responded when asked about his former coach's move to Arsenal. "But, respectfully, we aren't thinking about him anymore, the club is more than just one man. We are still energized from our title last season and we aren't slowing down." Joseeeeee lu lu lu, he might score one he might score two. Tidy pre-season there, ignoring Aidrie. 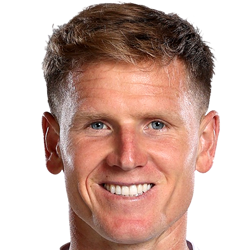 Matt Ritchie celebrates his brace against West Ham. 7.6 average rating. 2 goals. 1 assist. Team 'still has a lot to work on' after Spurs result, says Nolan. 7.2 average rating. 1 assist. "We're pressing on. We still have a lot to work on." 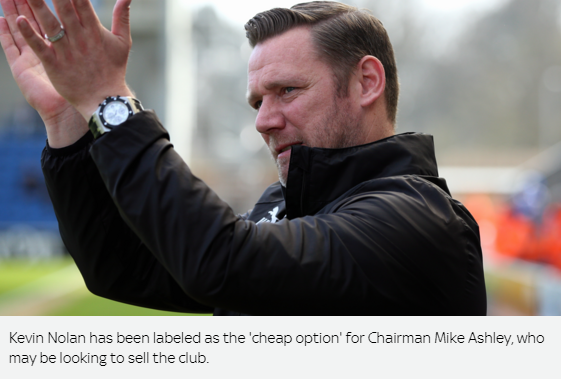 Kevin Nolan responded when asked about the team's current place in the Premier League. "People were talking about us being relegation contenders as the start of the season, especially after I took charge. But I think we are proving that we are more than that." "Of course the first priority is secure our place in the Premier League, that is our target first and foremost," Nolan went on to respond as press questioned his targets for the season. "But if we can manage that before the end of the season, which I think we can, then we will set our sights on finishing as high up the table as we possibly can, wherever that may be." When asked about his one-year contract, and if it meant that he was only a temporary appointment for the club, Nolan responded; "It's not in my mind right now. I am confident in my ability, and I will do my job. It's as simple as that. We shouldn't be thinking about these things right now, it's time to focus on the league."